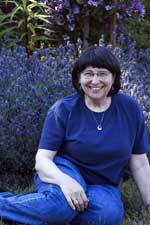 Evelyn is a Pacific Northwest native who learned to knit and crochet from her grandmothers. After leaving a corporate career in marketing for a simpler life, she was inspired to pick up her needles again by Elizabeth Zimmermann’s empowering approach to knitting. Along the way, she discovered a passion for lace knitting and enjoys sharing this addiction with others. Spinning is her new obsession, inspired by a Cheryl Oberle Knitaway in Taos and Spinning the Old Way by Priscilla Gibson-Roberts. Now handspun yarns are influencing her designs. Evelyn was the winner of the first Wild Fibers Magazine and Buffalo Gold contest. Her designs have been published by Fiber Trends and Leisure Arts, as well as knitting magazines and yarn companies. Knitting Lace Triangles, her first book, was published by Fiber Trends in July 2007. Her limited teaching schedule is on the Home page. Как вы видите, дизайны Эвелин — не только шали, но и носки, и смешные мелочи, и шарфы самых разных вариантов.